I have been home after my trip to Australia for quite some time. The dreaded jet-lag has washed off. You would think that I would be back in my loom working on my next large project. I do, after all, have a tremendous list of ideas in my head especially after having bought all that luscious silk from the super folks at Red Fish Dyeworks when I was in Canada. Well, yes, I have been back at the loom, but not at a large project. Instead, I have been weaving lots of lots of lovely bands! What fun it has been weaving these small projects after having spent so much time at one very large one…the black silk wrap…for a great part of this year. It was particularly fun using wool for some of these bands. And, why have I been weaving bands? 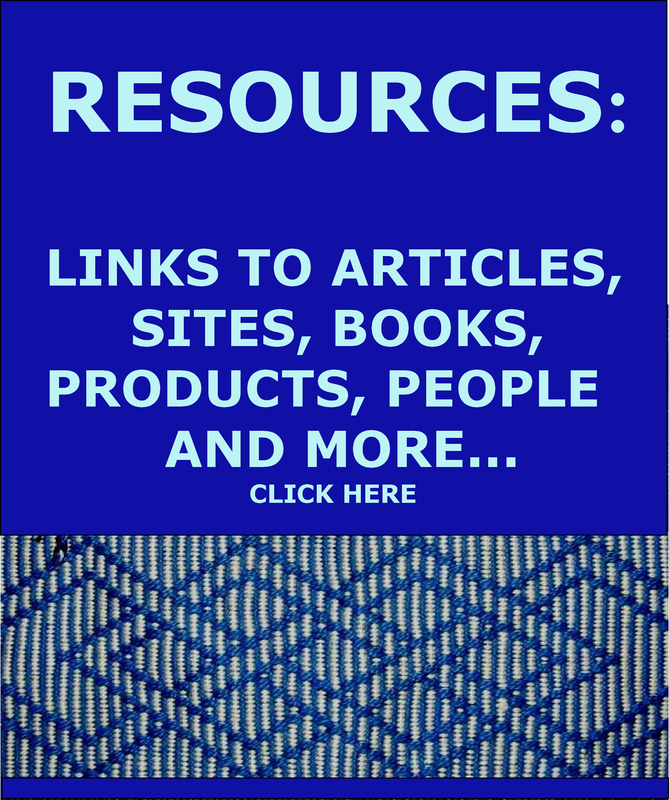 Because I have just published a new e-book on patternfish.com! The complementary-warp structure produces lovely double-faced bands like the ones you see at left. 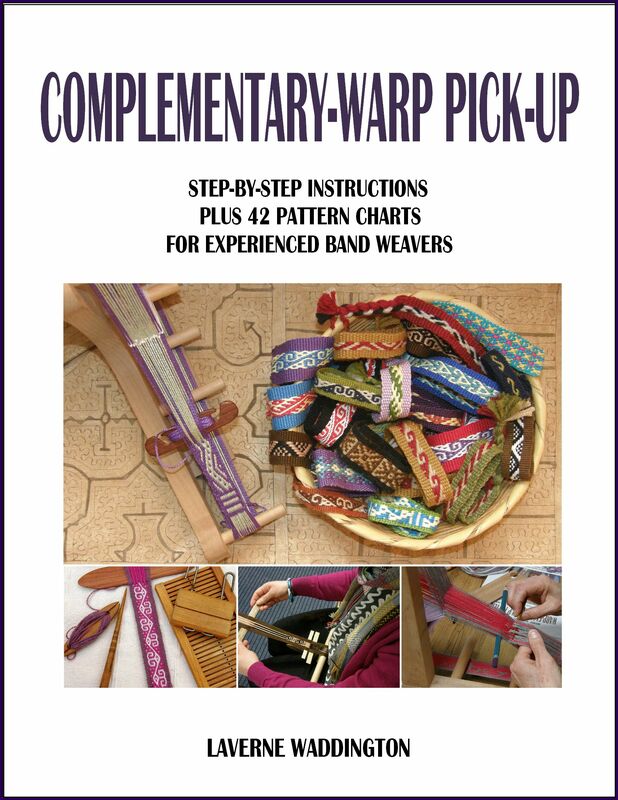 The method I teach in this book can be applied to any loom that allows the weaver to create warp-faced bands. The warp threads are divided into two simple sheds from which they are selected to create the patterns. Generally, two colors are used…one light and one dark. One shed on the loom holds all the light threads, and the other all the dark threads. Inkle loom weavers, for example, could place all the dark threads in the open position and all the light ones within the heddles. Weavers who like to use a rigid heddle to weave warp-faced bands need to thread all the ends of one color through the holes and the ends of the other color through the slots. While weaving some of the samples for this book, I enjoyed using the band lock and wooden rigid heddle that Becky and friends at Vavstuga so sweetly gave me the first time I visited. Vavstuga stocks various sizes of these cute band locks! But, I am sure that you know that I am a continuous-string-heddles gal at heart! And, of course, the other fans of those lovely continuous string heddles, will set up their warps for the complementary-warp pick-up technique by enclosing all the threads in one of the two colors in the string heddles and the others in the nifty shed loop. Remember that you can always refresh your memory on the warping technique by watching Method 2 on my free video. And, look at the fabulous guitar strap that Helen Deighan has woven since our Complementary-warp class in Australia! She has taken an idea that I would like to encourage further with my latest book, that is, using small motifs as border designs alongside larger patterns. I have provided charts for a variety of such pretty border patterns. 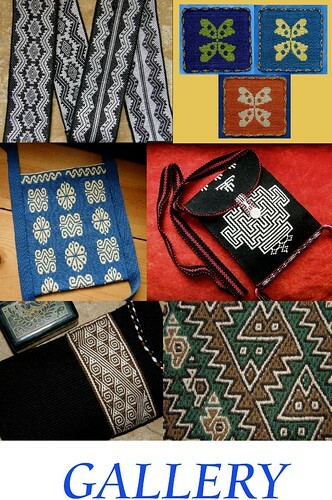 These smaller patterns alone would make lovely lanyards, shoe laces and straps for pouches. They also add a lot of interest along the edges of wider patterns. After finishing this latest book, I really want to thank all my weaving teachers, weaving friends and students who give me so many ideas and who are always so inspiring. And now, I find myself with a basketful of bands. The bands are pretty to look at and I might just leave them there. Or….. I could use the dozens of little jewelry findings I have been collecting such as, split rings, lobster-claw clasps and ribbon clamps, and make these bands part of my woven bracelet collection. From band to bracelet…quick and easy…no sewing required…I love that! I have to admit that I was really lucky to find that I had just the right size of ribbon clamp for this band. I have them in four or five sizes and various metal colors. I might also make some more jewelry with various closures, like buttons and braids, and give you some ideas for those in the next post. If you decide to buy my new book, I hope you enjoy it and I welcome any feedback. Of course I would love to see anything you weave using it. Could the techniques in your new book be applied to card weaving? Interesting question! I know that cards can be threaded with just two threads, one of each color, and turned to create two sheds…a dark one and a light one. I haven’t tried it myself. I know that only having two threads in the cards can be awkward and some people need to have the pack resting upright on a table for stability…but that’s all I can tell you! It’s not my area of expertise, I am afraid, but I am sure that one of my readers will be able to help with a comment. 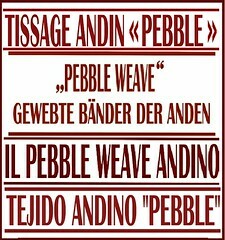 Great looking book, justgetting into inkle band weaving. Will place this. On my wish list for when I get more experiencd. Can youtell us more about the band locks are these used primarily in back strap weaving? 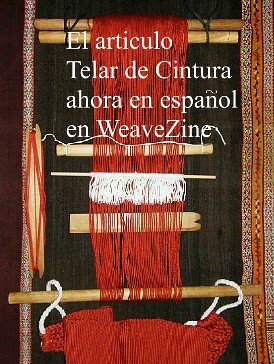 Band locks are used in some weaving cultures when the warp is being suspended at one end by the weaver’s body. I know that they are used in some forms of traditional Scandinavian band weaving. The little device usually has hooks on one side which attach to a belt around the weaver’s hips. Looks exciting! What lovely and marvelous weaving you create! The techniques in your new book look quite interesting, and all the bands are beautiful! I love that guitar strap that Helen made. 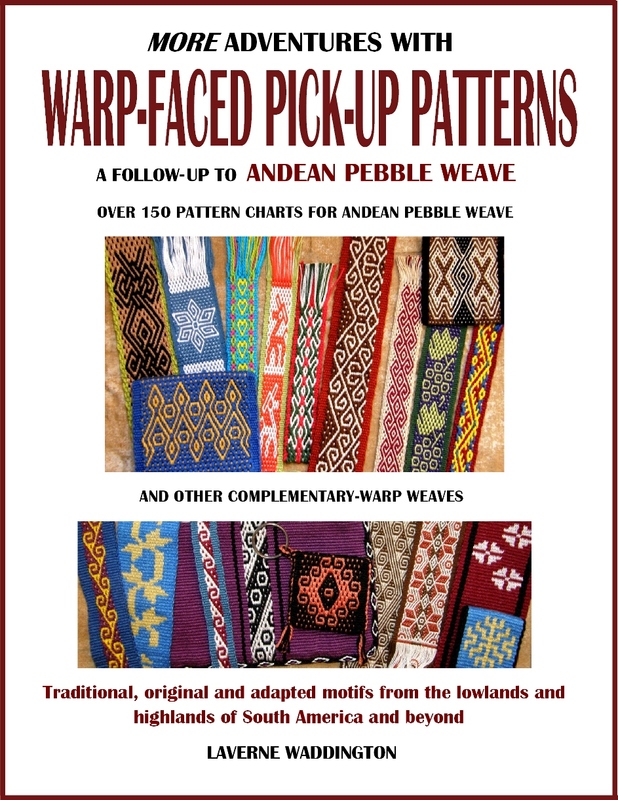 I’m still working my way through the Andean Pebble Weave book, and I can look forward to this new one! Hola, como puedo comprar este libro desde chile?